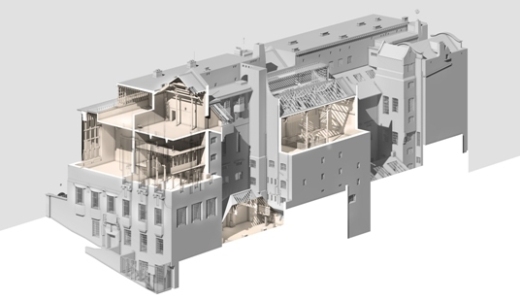 The 2014 fire at the Glasgow School of Art serves as a case study to explore the devastating effect that fire damage can have on historic buildings and cultural identity, what can be done in the way of sensitive reconstruction, and how 3D modelling techniques can be used as a tool for conservation. Finding an effective consolidant that's compatible with masonry in the long term can be challenging. Ben Newman explores the benefits and limitations of using nanolime on limestone and offers the City of London Cemetery entrance screen as an interesting case study. 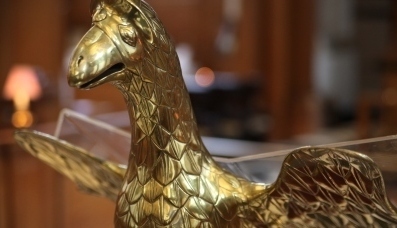 Author Marcus van der Meulen examines the history of Brass Eagle Lecterns in England spanning from the pre-Reformation period to present day. This thought provoking article by architect Neil McLaughlin argues that it is possible to adapt listed historic buildings to accomodate the growing needs of the local community, without destroying their instrinsic historic value. The Emmanuel Church in West Hampstead provides an interesting case study. It's not uncommon for churches and other places of worship to struggle to keep up with general maintenance. The National Churches Trust and the Heritage Lottery Fund have lent their support to buildings in Yorkshire by implementing the Yorkshire Maintenance Project, which helps to regularly maintain over 1,000 listed places of worship in the area and provide preventative training to avoid future issues. Movement in historic church bell towers or in the timber bell frames and their foundation beams can make bell ringing difficult. Structural engineer Andrew Dutton outlines the assessment of bell frames and bell towers in historic churches and considers a range of issues including the nature and potential implications of common bell frame alterations such as the insertion of concrete ring beams. What action can local authorities take to protect listed buildings at risk from spiralling deterioration? This article looks at the role of compulsory purchase orders, repair notices and back-to-back agreements. Blacksmithing teachers David Field and Adrian Legge look at the use of lead caulking to fix iron into masonry. The article includes an overview of how to reinstate lead-fixed ironwork to create a durable repair. Stone conservator Simon Swann provides an overview of mortar- and cement-based artificial stone, surveying the main types, such as Pulhamite and Roman cement, their historic uses and conservation best practice. This overview of ongoing research by the Fire Protection Association challenges previous theories and identifies aggressive venting of stoves and chimney blockages as the main sources of risk. An insight into the restoration of the Palace of Westminster's heavily worn tile schemes, from initial survey to the production of modern replacement tiles, re-laying of new tiles and piecing in of repairs. Learn how to identify the characteristic surface finishes of pit, mill and see-sawn timber or the distinctive ridged finish of cleft timber. Joe Thompson of Sussex Oak and Iron explains how evolving technologies left their mark on historic construction timber. Chairman of the Dry Stone Walling Association Richard Love looks at the historic development of dry stone walling, including its many regional variations, and explains the key challenges facing the craft today. Chartered architect Chris Bowes reviews the changes to The Construction (Design and Management) Regulations 2015 and their bearing on conservation projects. The article places particular emphasis on risk management on conservation sites. Stonemason and building conservator Nigel Copsey looks at the role of hot-mixed limewashes and sheltercoats in modern conservation practice and their advantages over lime putty mixes, including some strange recipes from historic sources. India's conservation movement is relatively new but it is developing rapidly, driven forwards by an energetic group of Indian conservation architects. James Simpson explores this exciting and critical period for some of the world’s finest cultural heritage.